GP3 Championship hopeful Dean Stoneman says that having come back from cancer two years ago, this weekend's decider in United Arab Emirates holds no fear. The 24-year-old is second in the standings, 48 points behind fellow Brit Alex Lynn with 49 points available. Stoneman has four victories in GP3 this year, including in Sochi last weekend. 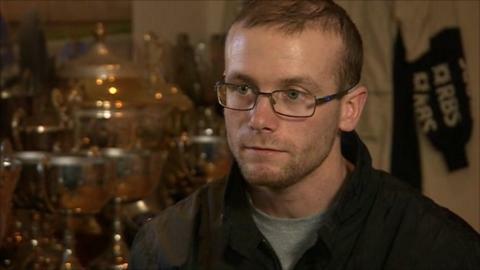 "It's great to be back on the podium after fighting testicular cancer," Stoneman told BBC South Today. "That was the biggest race of my life." After overcoming the disease, Croydon-born Stoneman swapped cars for boats, eventually winning the P1 UK powerboat title in 2012. However, this year he has found himself back in motor racing, driving for Koiranen GP and finds himself with a chance of Championship victory. It marks an amazing return for Stoneman following his health worries in recent years, and he admitted it is nice to have proved he could return to racing. "I'm still struggling with side effects, that's the way it is," he said. "Driving the car is tough, but I have to deal with it and keep pushing on. "At the time I didn't worry about racing, I was just concentrating on surviving. "But I've come back, I've proved that I've still got the speed. At the moment, the ongoing issue is the side effects because of the chemotherapy I had in 2011. "All I can do is keep going, keep adapting my issues around my driving. It's definitely been tough. "It's nice to walk around the pits and hear people say that I was on my deathbed and I've come back and proved everyone wrong. You have to enjoy every day as if it is your last because you don't know what is around the corner. Just look at Jules Bianchi (F1 driver). He has a freak accident, so just enjoy every day." Stoneman admitted that with only 49 points on offer in the UAE, the Championship may be out of reach, but he said coming second would still represent a good season. "The Championship is very close," he said. "Alex only needs a couple of points and all I can do is keep pushing and see if I can win the Championship. "At the moment the aim is second in the Championship. It's going to be difficult to win. Alex is 48 ahead with 49 available, the main competition is second, third and fourth. All I aim to do is concentrate on second and bring the car home." Stoneman, who had secured a test with the Williams F1 team after winning the F2 title in 2010, said he is unsure what he will do next season, admitting he may not necessarily race in GP3. "It's hard to know where to go next," he said. "It's all down about budget, it's so expensive, the next step. I'm just keeping my options open and concentrating on this weekend."